You may recall that Blaine County Judge Ted Israel recently dismissed a felony elk poaching charge against anti-wolf activist Tony Mayer, the founder of SaveElk.com. At that time, the court held that there was probable cause to pursue misdemeanor charges for the offense. However, Mr. Mayer’s felony charge was dismissed without prejudice because to charge on a felony prosecutors needed to establish that he had poached an animal worth more than $1000 (“trophy” bull elk are valued at $5000). At that time, the measurements prosecutors used to determine the “trophy” status of the animal were taken before it had dried at room temperature for 60 days, a Boone and Crockett protocol allowing for “shrinkage” (the antlers had been admittedly stored in a freezer for a period of time). 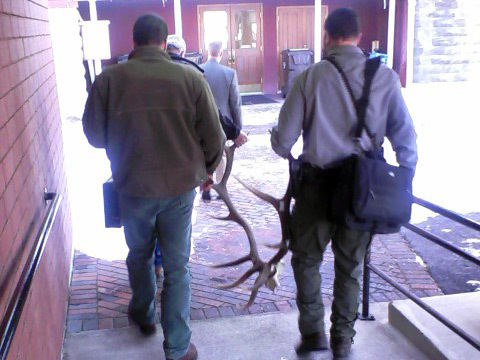 After the initial measurement of the elk Mayer killed, but by the time pre-trial rolled around and the court issued its dismissal on the felony charge, the antlers had been stored at room temperature for 60 days allowing prosecutors to immediately have the rack re-measured and determine that even with shrinkage it was still a trophy animal pursuant to statute. The prosecutor re-filed the felony against Mayer. Defendants have a right to a “pre-trial hearing” to demand demonstration of probable cause and contest the prosecution’s evidentiary basis for pursuing its charge. In order to move a felony charge to trial, the prosecutor needed to establish that there is probable cause to believe that several essential elements of an infraction of law took place. Today, Mayer stood pre-trial on the re-filed felony for “flagrant unlawful killing and/or possession of a trophy bull elk,” again arguing for a dismissal of the charge . There was little debate about whether prosecutors had demonstrated probable cause as to the essential elements of poaching the elk. After all, that question was largely settled in Judge Israel’s court with the misdemeanor charges. The prosecution called a witness, an Idaho Department of Fish and Game Conservation Officer (CO), who testified as to Mayer’s publication of his experience on a bow-hunting website describing the kill after the season ended in the Sawtooth Zone. The CO testified that the investigation has considered what could possibly be a high-powered bullet wound in the animal, recovering metal shavings apparently taken from the surrounding tissue. The elk tag that Mayer acquired was purchased after close of the hunt (October 4) with notches cut out of the tag margins indicating that the tag was filled on October 4 (season ended September 30) with slits in the paper tag less conspicuously marking September 30. Officers recovered photographs of the experience on Mayer’s personal computer at home with the image files being labeled by date, October 3, a dates subsequent to the close of season. The files were held in a folder labeled “Alturas Hunt – 10/09”. Rather than focus on the factual elements of the case establishing poaching had taken place, Mayer’s attorney set forth an aggressive defense challenging its elevation to a felony offense. As mentioned before, in order to charge Mayer with a felony, prosecutors must demonstrate that the value of the wildlife exceeds $1000. To do that, they need the elk to be a “trophy” specimen. The prosecutor had previously laid the foundation for such by calling a seasoned Boone and Crockett Scorer who has been scoring elk racks for over 30 years as an expert witness. Boone and Crockett standards set forth a generalized protocol or methodology by which to measure a bull elk’s antlers and relate those measurements to a point system. That point system is counted in increments of eighths (1/8). This Boone and Crockett appointed scorer had scored the rack submitted as evidence against Mayer at 303 and 1/8 points before it had been stored at room temperature for 60 days and taken a subsequent measurement on October 20, after 60 days, registering a score of 303 and 2/8 points. Mayer’s attorney argued that the state definition of a “trophy” elk is unduly ambiguous and submitted to the court case-law (previous higher court decisions that guide lower court decisions) directing a trial court to err on the side of the accused when a statute is so unduly vague as to confuse a reasonable person. The Defense laid the foundation for its claim that the statute was unduly ambiguous with the prosecutor’s Boone and Crockett expert witness’s testimony acknowledging it to be true that organizationally, Boon and Crockett sets a threshold score of 360 points or more to recognize a bull elk as a “trophy” animal for its organizational purposes. Seizing on this testimony, Mayer’s attorney pointed out to the judge that the statute requires that a trophy be “deemed a trophy as per Boone and Crockett standards” but statutorily sets the threshold for “trophy” at 300 points as per the subsequent sub-section ‘3’. It seemed, he alleged, that Code 36-202(h) was at odds with itself at what constitutes a “trophy” animal – the Boon and Crocket score of 360 or the Idaho Code 36-202(h)(3) score of 300. (h) “Trophy big game animal” means any big game animal deemed a trophy as defined in this subsection (h)1. through 8. For the purpose of this section, a score shall be determined from the antlers of the mule deer, white-tailed deer or elk as measured by the copyrighted Boone and Crockett scoring system. The highest of the typical or nontypical scores shall be used for determining the total score. This subsequently legislated change of language, more clear in its explicit intention that a score be determined “as measured by the copyrighted Boone and Crockett scoring system” with the threshold for “trophy” being statutorily set at 300 points, was only necessary because the Idaho legislature acknowledged the ambiguity of the previous language. Because Mayer had not exceeded the Boone and Crockett threshold standard of 360 points as reasonably suggested by the language of the previous statute, the Defense argued, the judge should grant Mayer the benefit of that ambiguity as directed by the case-law relating to vagueness and hold that the prosecution failed in establishing probable cause that the animal Mayer had killed was a “trophy” bull elk. Before recessing to consider the parties’ argument, Judge Walker made clear his ruling for the record that the prosecution had made its case that there was probable cause concerning the elements of the charge demonstrating that Mayer had likely poached the elk in question. However, the judge seemed interested in giving due regard to Mayer’s argument concerning the ambiguity of the statute and whether or not that meant the felony should be dropped in extending the accused a ruling that the prosecutor failed to demonstrate probable cause that the animal was a “trophy” bull. After a short recess, the judge came back and explained to those in attendance his holding that the plain language of Idaho Code 36-202(h), even prior to its change subsequent to the alleged offense, should be read by a reasonable person to set forth that the Boone and Crockette methodology for scoring/measuring was to be used and that “For the purpose of this section” the threshold score for a “trophy” bull elk was refined (not in conflict) by subsection (3). Nice explanation and write up Brian..
Like I’ve always said, if people are so concerned with the population, they’d stop shooting deadly projectiles at them. Save our elk from wolves so we can poach them for ourselves. Tony Mayer is a god dam hypocrite! I hope he loses his hunting privileges for life. Rammell was on local talk radio in Boise last night still claiming he did nothing wrong, blaming Sportsmens Warehouse and crying about how those big bully game wardens and police officers violated his rights. I’m just waiting to see who the next anti-wolf poacher will be. Mayer and Rammell have already been accused of it, who will be next? These people think they are such noble sportsmen and yet they go and break the laws. What a bunch of hypocrites. Dunno about the rest of you armchair Daniel Boones and Davy Crocketts out there, but that rack looks sorta small to me for a 6-point ” trophy ” . Skinny antlers that don’t even make it waist high. Twenty years ago when I was still frequenting the high country outfitter camps in NW Wyoming, we would’ve passed on it till near the end of the hunt. Sign of the times I guess if this is in fact what passes for a “Big Bull” these days. We have a permanent Boone & Crockett exhibit here in Cody WY with a couple of big elk. I happened to refresh my eyeball green score calibrators on those last Saturday. Having said that , trophy or not ( I hope it is) , this guy needs to gets hammered flat and his hunting privileges curtailed rather dramatically. Boone and Crockett sets “Trophy” at 360 points. Idaho statute for consideration of poaching sets “trophy” at 300 points. In person, the rack is impressive. Cody – the antlers were impressive. They certainly would come waist high on many people including me. I doubt that many hunters would have “passed” on this bull. To start with, the whole idea that a living creature’s life should have a dollar value assigned to it based on arbitrary human values disgusts me. That it should have a greater or lesser dollar value assigned to it based on physical attributes that can be entered in a record book? Entirely warped and pathetic. Dollar values are an absolute necessity if the citizens of a state are to seek financial recompense for wildlife killed illegally–whether it is via poaching, poisoning, or any other activity. We assign dollar values to all sorts of living creatures from both the plant and animal kingdom. Wyoming finally adopted statutory dollar values of wildlife to be used when sentencing wildlife violators, since poachers are stealing a public resource. It is used by Judges to asses a ” restitution” value for trophy game , for instance. A notorious serial poacher , Gary Voorhies of Greybull WY had to pay $ 12,500 for a huge Bighorn ram taken on Christmas eve a few years ago. Bull elk might be assessed at $ 10,000 and trophy Mule Deer at $ 7500 , for instance. It goes all the way down the list past pretty much every wild animal out there , to Cottontail Rabbit, worth $ 200 in the eyes of the law . But there is one glaring omission : Wolves. Even though the state of Wyoming ( on paper anyway ) supports having a trophy Wolf hunting zone around Yellowstone and managed hunts for same , the Game & Fish Commission has yet to set or even recommend a dollar value for wolves taken illegally. I never pass up an opportunity to remind them of this. At a spring 2008 meeting to explain Wyoming’s wolf management plan , I asked the state G&F Trophy Game Coordinator Bill Rudd what the positive value of a wolf might be; the dollar value for restitution purposes. He went livid. He said wolves have no positive value to Wyoming. I will continue reminding them , nevertheless. Oh, the duplicity…. I guess I’m not fully understanding the dollar values vs the fact that he shot AN elk out of season. If it had been a spike, cow or elk fawn, does that somehow lessen the value in some (or many?) minds when it comes to the fact he was poaching? Yes, based on presiding law, it does..poaching is the crime if convicted, but the value determines the penalty, just like it does in drug cases, get caught with an oz of pot, I can guarantee you the penalty will be far less than if you are caught with a ton.. Curious, how long have these laws (regarding size) been on the books SB? And who established them? We had trophy laws in Washington when I live there over 20 years ago, and as far as I know, the Game Commissions established them..The game commissions have certain powers to enact laws, then they are approved by the legislature of the respective states.. In most states the simple act of poaching is nothing more than a misdemeanor, meaning minimal or no jail time, you can loose your hunting privileges, but in many of these misdemeanor cases people don’t. Now with the asingment of value, we have allow the laws to expand and charge felonies, which is a whole different ball game, once charged and convicted of a felony, you can loose a lot, your truck, your gun, your freedom, you ability to ever buy a hunting license again, this is a benefit.. Without value, it would continue to be no more important than a speeding ticket, and we need it to be serious..
SB, I guess value is in the eye of the beholder. You may not accept it, but at this point in time, our society thrives on assigning value to things, we do it in every walk and phase of life, Murder is classified by many different values, drugs are classified by value, car accidents are classified by value and theft is classified by value…and poaching is theft in the eyes of the law, and of course it is going to be assigned a value..